A Wrinkle in Time was only the beginning: here, together for the first time in a deluxe Library of America edition, are the thrilling adventures of Meg Murray's daughter Polly. Madeleine L'Engle's A Wrinkle in Time is one of the most beloved and influential novels for young readers ever written, a thrilling tale in which fourteen-year-old Meg Murry and her schoolmate Calvin O'Keefe use a tesseract to travel across space and time to save Meg's scientist father from dire forces threatening the universe. But A Wrinkle in Time was only the beginning of the adventure. Now, for the first time, L'Engle's iconic classic and all seven of its sequels--the complete Kairos ("cosmic time") novels--are collected in a deluxe two-volume Library of America edition, together with never-seen-before deleted passages and hard-to-find essays in which L'Engle reflects on her work. This second volume gathers the final four Kairos novels, in which Meg and Calvin's daughter Polly takes center stage. 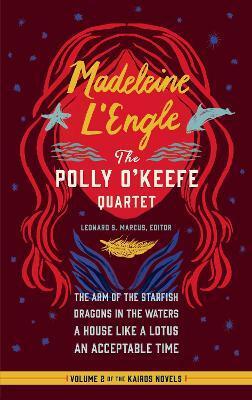 In The Arm of the Starfish, Polly disappears, and Calvin's research assistant is implicated in her kidnapping. In Dragons in the Waters, Polly and her brother Charles are on a steamer bound for Venezuela when they help solve a murder connected to a stolen portrait of Simon Bolivar. Polly receives an education in different kinds of love in A House Like a Lotus. And in An Acceptable Time, Polly is lured through a tesseract by a friend who may be hoping to sacrifice Polly in order to save himself. A companion volume gathers the first four Kairos Novels, the Wrinkle in Time quartet, which also includes A Wind in the Door, A Swiftly Tilting Planet, and Many Waters. LIBRARY OF AMERICA is an independent nonprofit cultural organization founded in 1979 to preserve our nation's literary heritage by publishing, and keeping permanently in print, America's best and most significant writing. The Library of America series includes more than 300 volumes to date, authoritative editions that average 1,000 pages in length, feature cloth covers, sewn bindings, and ribbon markers, and are printed on premium acid-free paper that will last for centuries. Madeleine L'Engle (1918-2007) was the recipient of the Newbery Medal, the National Book Award, and the National Humanities Medal among many other honors over the course of her remarkable career. Most famous for A Wrinkle in Time, she was the author of more than sixty books, including young adult and adult fiction, poetry, autobiographies, and books on religion. Born in New York City and educated at Smith College, she was for many years associated with the Cathedral of St. John the Divine in New York as librarian and writer-in-residence. Leonard S. Marcus is one of the world's leading writers on children's books and the people who create them. He is the author of Margaret Wise Brown: Awakened by the Moon, Dear Genius: The Letters of Ursula Nordstrom, The Annotated Phantom Tollbooth, and Listening for Madeleine: A Portrait of Madeleine L'Engle in Many Voices, among other books. He reviews children's books for The New York Times, teaches at New York University and the School of Visual Arts, and lectures around the world.